Surface-mount technology (SMT) is a method for producing electronic circuits in which the components are mounted or placed directly onto the surface of printed circuit boards (PCBs). An electronic device so made is called a surface-mount device (SMD). 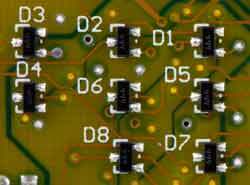 In the industry it has largely replaced the through-hole technology construction method of fitting components with wire leads into holes in the circuit board. SMD transistors and diodes often share the same types of package. While diodes only have two electrodes a package having three enables the orientation to be correctly selected. Although a variety of SMT transistor and diode packages are available, some of the most popular are given in the list below. SOT-23 - Small Outline Transistor: This is SMT package has three terminals for a diode of transistor, but it can have more pins when it may be used for small integrated circuits such as an operational amplifier, etc. It measures 3 mm x 1.75 mm x 1.3 mm. SOT-223 - Small Outline Transistor: This package is used for higher power devices. It measures 6.7 mm x 3.7 mm x 1.8 mm. There are generally four terminals, one of which is a large heat-transfer pad. There are many forms of package that are used for SMD ICs. Although there is a large variety, each one has the areas where its use is particularly applicable. VSOP - Very Small Outline Package: This is smaller than the QSOP and has pin spacing of 0.4, 0.5, or 0.65 mm. QFP- Quad flat pack: The QFP is the generic type of flat package for ICs. There are several variants as detailed below. LQFP - Low profile Quad Flat Pack: This package has pins on all four sides. Pin spacing varies according to the IC, but the height is 1.4 mm. PQFP - Plastic Quad Flat Pack: A square plastic package with equal number of gull wing style pins on each side. Typically narrow spacing and often 44 or more pins. Normally used for VLSI circuits. CQFP - Ceramic Quad Flat Pack: A ceramic version of the PQFP. TQFP - Thin Quad Flat Pack: A thin version of the PQFP. BGA - Ball Grid Array: A package that uses pads underneath the package to make contact with the printed circuit board. Before soldering the pads appear as solder balls, giving rise to the name. SMT surface mount technology packages are used for most printed circuit designs that are going to be manufactured in any quantity. Although it may appear there is a relatively wide number of different packages, the level of standardisation is still sufficiently good. In any case it arises mainly out of the enormous variety in the function of the components.